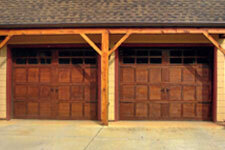 The model 882 is a residential 1 or 2 car wooden carriage house door. The 882 is available in sizes up to 20 feet. These doors are made of solid hemlock with no finger joints for a long life. The 882 is available with flat masonite panels, raised hardboard panels, raised or flat hemlock panels with many optional glass designs also available to compliment your home with that old world charm. The model 882 is also available in other species of wood for quoting by request. 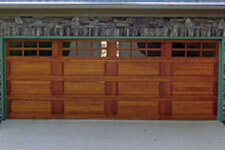 Click here to view the various layouts for this model door. Note: All measurements are square to square and do not include quarter round. Shown with optional flat hemlock panels, stockton glass top and wrought iron decorative hardware. Shown with optional raised hemlock panels and stockton glass top.